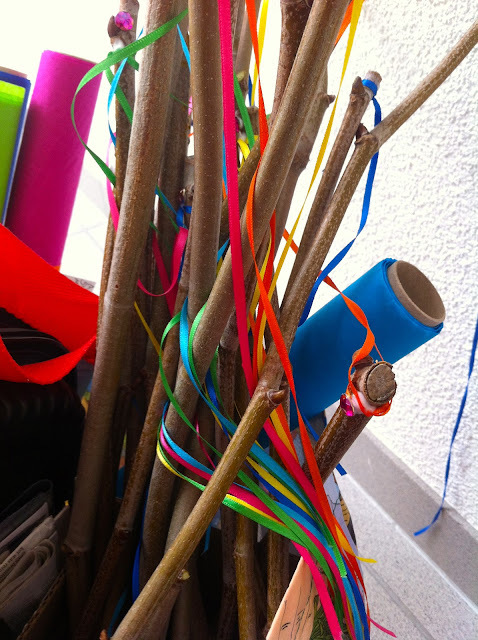 This is a great birthday party craft which I found in "The Children's Year" by Cooper, Fynes-Clinton, and Rowling! We did it for my daughter's 3rd grade birthday a long time ago as a part of a fairy birthday celebration, and it was a lot of fun. Children that age can do most of the craft on their own. We recently did this at a party for a first grader and the children needed a lot of adult help. some black pipe cleaners folded in half. I had sticks which had recently been pruned from a plane tree, but of course you could buy small dowels. I tied pretty little ribbons onto the ends of the sticks and secured with a dot of glue. You could use thread or string if you want. I added a jewel to each stick for some sparkle. Show the children how to put a twist in the bend of the pipe cleaner for the bottom of the butterfly. Each child may pick two colors of tissue paper and pinch the middle together. These are the wings. Now place the wings between the twisted pipe cleaner and twist the top to make a head and the antennae. This part was hard for first graders because of the difficulty holding the scrunched tissue paper while twisting the pipe cleaner. Now knot the ribbon below the antennae. The wands are done! The children at the party ran and played and danced with their butterflies held aloft and flying behind them! It was so cute, I wish you could have seen it. Look how pretty the butterflies look all collected in a box. If you had a tall vase they would make a beautiful centerpiece when you sit down for birthday cake. We made these in my daycare last year. We picked the sticks up earlier in the day while we were out on a nature walk. The kids loved them! I've been away.. again..Stop by if you get a chance, I have some beautiful news to share. Take care. Thanks so much for sharing your recent craft ideas. We will be starting a local homeschool group this week, in the woods, sort of a Forest Kindy - although mixed ages. I am definitely going to incorporate some of these ideas, the weaving, the butterfly wands...thanks! Lovely idea for outdoors on a nice day, thank you !